We issue a monthly SAORI REPORT for people who enjoy Saori Weaving.The printed SAORI REPORT has interesting and valuable information such as Misao Jo's philosophy, NPO SAORI-HIROBA's activities, latest event information and ideas or making a Saori clothing etc. The printed version is in Japanese. We would be very happy to have you on our subscribers list. 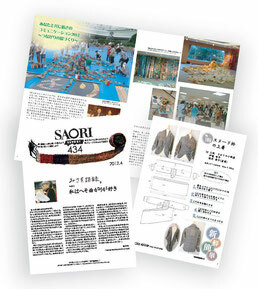 *You can receive the monthly SAORI Report (in Japanese) by airmail from April 2014 to March 2015. For all subscribers please send the following information. *2014 subscriptions to the SAORI Report will end the 31st of March 2015.If you want to continue to receive the reports after that date please re-subscribe for 2015. We will let you know how to continue your subscription in March 2015. *If you subscribe after April, we will send the back numbers from April to the month when you subscribe. After that, we will send the SAORI REPORT monthly. From KIds to Adults! SAORI wooden loom "Hiyoko"